From running one of London’s smallest but boldest new writing fringe theatres, the Bush, to Shakespeare’s three-tiered Globe, Dominic Dromgoole is now set on a new departure – nothing less than bringing proscenium style theatre back to proscenium theatres! Or rather, celebrating a style of performance that in any other theatre would starchy, arch and horribly out of date. Not that A Woman of No Importance, for all the tinkering and restoring of Wilde’s original drafts and amendments, doesn’t draw exactly that kind of reaction. Witty epigram after witty epigram falls from the lips of Eleanor Bron, Anne Reid and Emma Fielding’s aristocratic matrons – Lady Caroline, Lady Hunstanton and the naughty Mrs Allonby – as they sit around in satin finery, swopping quips about marriage, women, and their husbands. The problem is, Wildean repartee was made for the man himself – as indeed his alter ego in A Woman of No Importance, Lord Illingworth, could perhaps only best be carried off by an actor with the insouciance and mocking, devil-may-care arrogance of a Wilde. There aren’t many of them around these days – dandys with a heart! As it is, Dominic Rowan’s Lord Illingworth delivers his cutting remarks, one feels, with a certain reluctance. 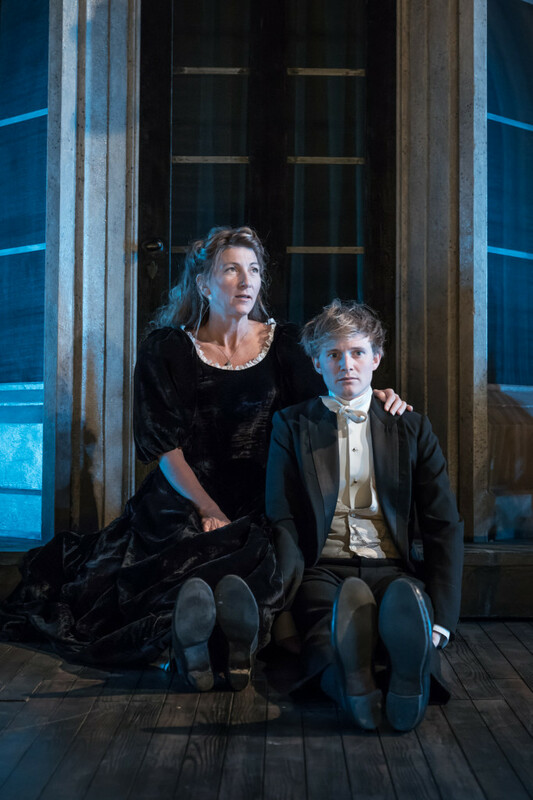 But as with Eve Best’s `fallen’ Mrs Arbuthnot, the wronged party after a disastrous tryst 20 years ago resulting in bearing his child out of wedlock, Rowan’s portrait finally becomes a haunting picture of a cruel, amoral dilettante, playing with emotions just as he does words. Best too finally comes into her own in the harrowing final quarter of the play when in true Wildean style, he forsakes the mask to reveal human emotions beneath. You marvel afresh at the speech he gives Mrs Arburthnot about being a mother, its sensitivity about motherhood and the love and pain it jointly brings. 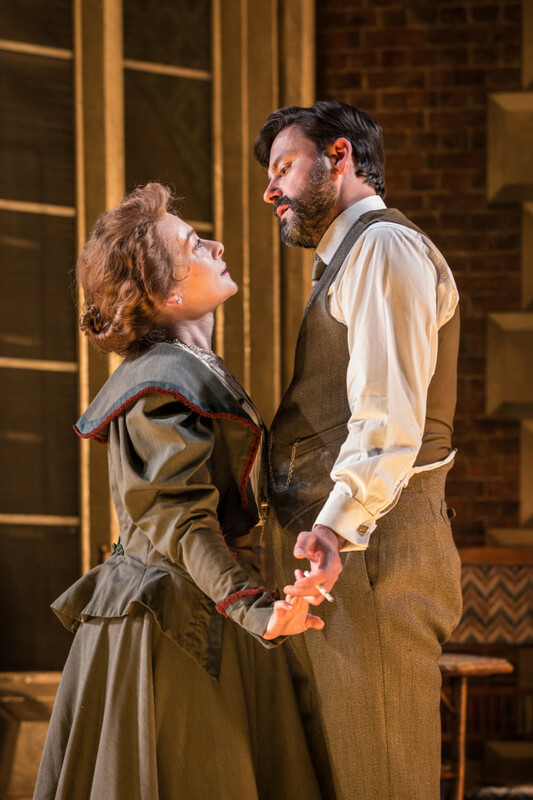 And at every turn in the last quarter of the play, lines jolt into today’s relevancy as if Wilde had penned them with half an eye on today’s headlines to do with sexual and power abuse. For when all is said and done, like Strindberg, like Shaw, Wilde’s wit is actually at the service of a forensic analysis of the battle of the sexes and in particular, like Shaw, an indictment of the double standards and hypocritical patriarchal conventions operating in his society and still with us today. 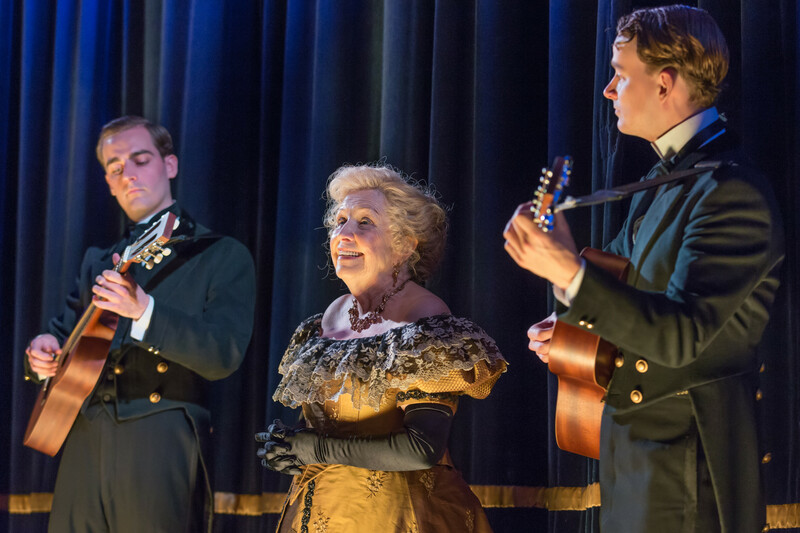 Dromgoole’s production in the Vaudeville, itself handsomely restored to delicate finery by Nica Burns’ Nimax theatres, sits therefore very prettily, indeed triumphantly, conjuring up not only ghosts from the Vaudeville’s own illustrious past but bringing it forward into now. Best makes a forceful, moralistic figure of Mrs Arbuthnot and there are delightful cameos from Sam Cox as Lady Caroline’s over-protected husband, Sir John – only too eager to escape her eagle eye – and from William Gaunt as the Reverend Daubeny whose account of his wife’s infirmities is, in itself, a sad little gem. But it is in introducing some of Victorian music hall’s sentimental ballads as inter-act divertissements that Dromgoole perhaps finds his deftest touch. Anne Reid, accompanied by her `staff’ of butler and maids, finds a perfect pitch that blends sincerity with just the merest hint of irony. Indeed, the cautionary temperance tale of poor homeless Betty, left to fend for herself because of a `drunkard father’ and dead mother takes on added pathos in the light of today’s homeless stretching along the Strand, just outside the Vaudeville theatre’s doors. Judging by the audience, Dromgoole’s year long Wildean fest isn’t going to get the young avant gardists and trendsetters necessarily flocking to the Strand, as Wilde did in his day. All the same, it’s an intriguing choice for the next stage of Dromgoole’s journey and one that delivers not just pertinence and moral depth but an emotional tug, to boot. Next up beginning in January, De Profundis, adapted by Frank McGuinness and Lady Windemere’s Fan, directed by Kathy Burke. Mouth-watering. 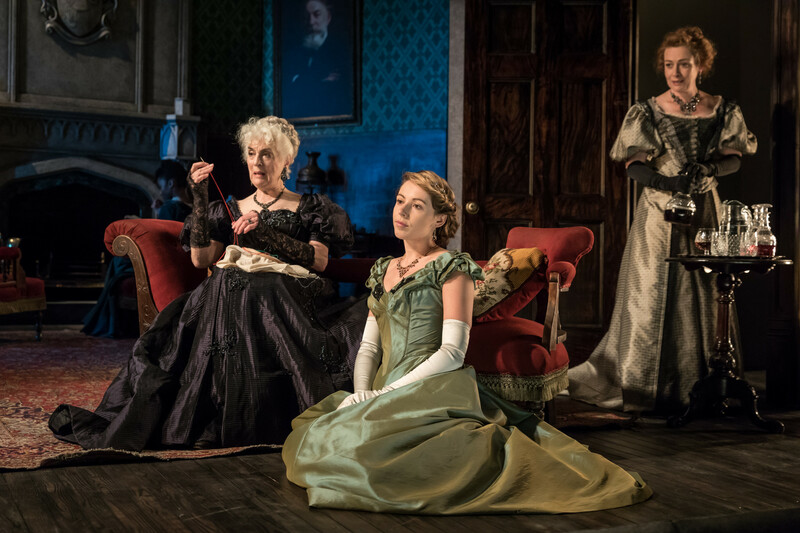 First perf of this production of A Woman of No Importance at the Vaudeville Theatre, London, Oct 6, 2017. Runs to Dec 30, 2017. This entry was posted in 2017, Reviews and tagged Anne Reid, battle of the sexes, Classic Spring Theatre Company, Dominic Rowan, double standards, Eleanor Bron, Emma Fielding, Eve Best, Jonathan Fensom, Osccar Wilde, social comedy, Vaudeville Theatre, West End, William Baunt on October 27, 2017 by Carole Woddis.